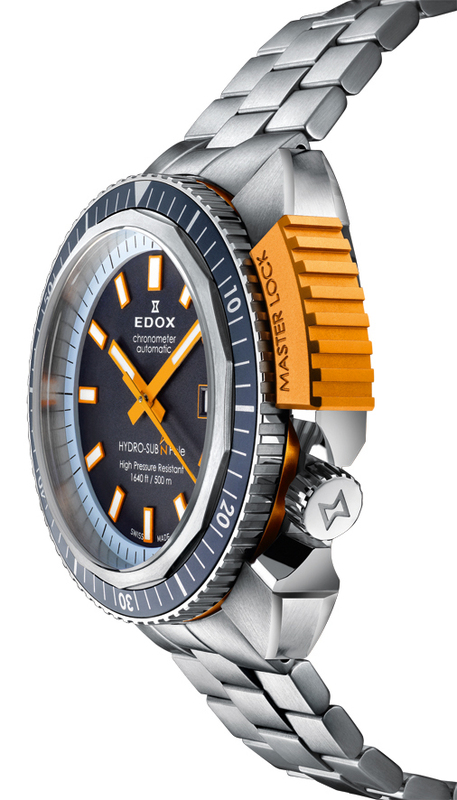 A vintage remake with a twist, the Edox Hydro Sub North Pole is rated to 500 m and equipped with a distinctive orange crown protector. And it will be the official timepiece in an expedition to free dive under the North Pole in 2015. Based on the first Hydro Sub of 1965, the new Hydro Sub North Pole is not just another reissue. 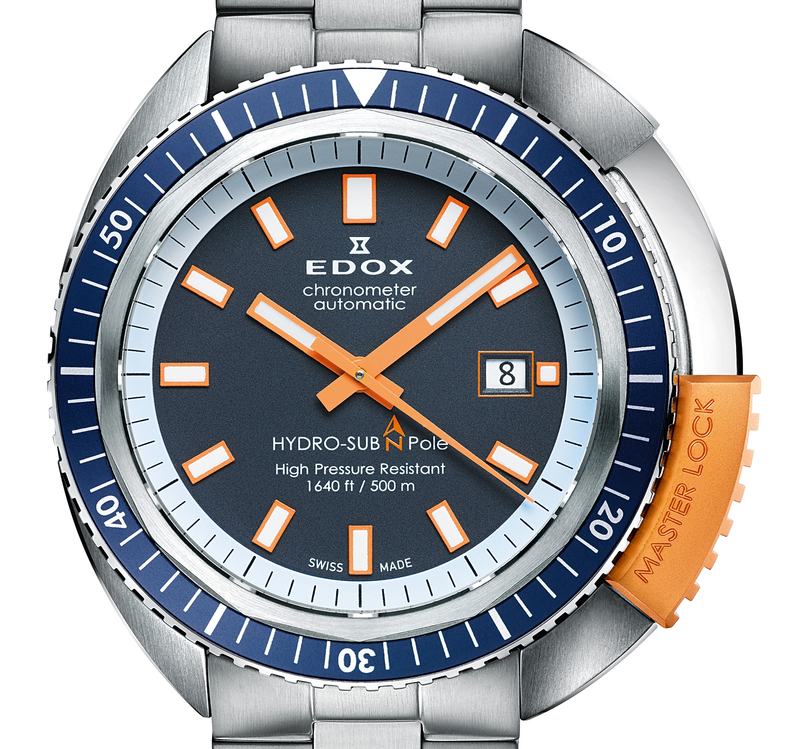 Though it has a cushion-shaped case like the original, the Hydro Sub North Pole features a distinctive, orange protector for the crown. The crown cover slides upwards to reveal the crown for winding and setting, and can be locked in position over the crown to protect it. Like the original, the Hydro Sub North Pole is water-resistant to 500 m. And to prove its chops, the Hydro Sub North Pole will be on the wrist of Austrian Christian Redl when he attempts to become the first person to free dive under the ice of the North Pole in 2015. Just like the case, the dial also has a sixties aesthetic. Its oblong markers and hands are taken from the 1965 Hydro Sub. 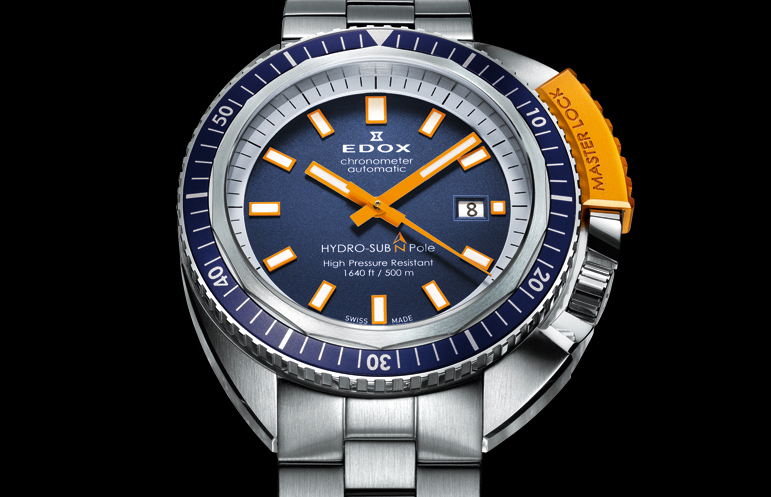 They are in orange to match the crown protector, against a dark blue dial surface. Measuring 46 mm in diameter without the crown cover – the crown cover adds another 3 mm to the diameter – the Hydro Sub North Pole has a stainless case case with a COSC certified ETA 2824 inside. The Hydro Sub North Pole is delivered on a steel bracelet with an additional leather strap. It is limited to 350 pieces with a retail price of 3645 Singapore dollars or €2100. That is equivalent to about US$2900.